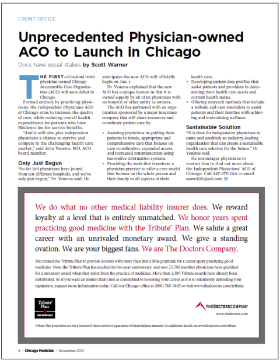 A 100% physician owned Chicago Accountable Care Organization (ACO) will soon debut in Chicago. Formed entirely by practicing physicians, the Independent Physicians ACO of Chicago aims to increase the quality of care, while reducing overall health expenditures for patients who have Medicare fee-for-service benefits. “And it will also give independent physicians a chance to survive and compete in the challenging health care market,” said John Venetos, MD, ACO board member. “So far 100 physicians have joined from ten different hospitals, and we’ve only just begun,” Dr. Venetos said. He anticipates the new ACO will officially begin on Jan. 1. Dr. Venetos explained that the new ACO has a unique feature in that it is owned equally by all of its physicians with no hospital or other entity as owners. Assisting physicians in guiding their patients to timely, appropriate and comprehensive care that focuses on care coordination, expanded access and increased communication using innovative information systems. Providing the tools that transform a physician practice to offer a care model that focuses on the whole person and their family in all aspects of their health care. Developing patient data profiles that assist patients and providers in determining their health care needs and current health status. Offering outreach methods that include a website and care reminders to assist patients and their families with achieving and maintaining wellness. “It is time for independent physicians to unite and establish an industry-leading organization that can create a sustainable health care solution for the future,” Dr. Venetos said.